Big Cash Win slot is traditional 3 reel slot machine. 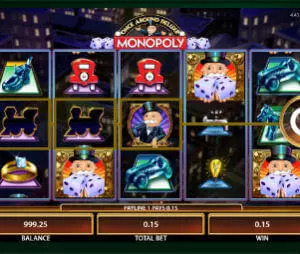 If you are looking for the classic casino experiences, with familiar symbols and sounds, you will enjoy this slot machine. It’s simple and fun . If you are in the mood for new exiting effects and features, you should check one of Rival i-slots games. You can play this game for real money in one of the Rival casino sites listed below. We tested the 3 reel Big Cash Win slot on our 100 spins test series. See the video below. Update: Recently Rival launched a nice up-to-date 3 reel slot machine: Pistols and Roses. Our bet per line was $1 and the biggest win was of $20. The bottom line, we ended up winning $14 on $100 bets and that’s without hitting any major combination, which is nice. The slot payout is relatively stable and although big jackpots do not come often, you will still get good value for your money. We had some winnings every 2.4 spins. The highest paying symbol is the green Big Cash Win symbol. Three of those will bring you 2,000 coins. The other high paying symbols are the traditional 7’s and cherries, which will bring you 400 and 300 coins. Big Cash Win, as most classic slots, is very simple to play. You have 2 button which control the bet size; the coin value button and the amount of coins. Other button are the Spin, Stop and Auto play. The minimum coin value is $0.1 and the maximum is $5. Placing the maximum bet will give you a chance to win $10,000 jackpot. You can try playing some of the Rival slots for free on our Free Slot Machines section.